The other notable Middle East-related anniversary today involves another European victory over the Muslims, this one over the Ottomans in 1687 at Mohács, which today is located in southern Hungary. The was part of the Great Turkish War, which ran 1683-1699 and pitted the “Holy League” (the Habsburg Empire, Russia, Poland-Lithuania, Venice, Hungary, Croatia, and some scattered Greek and Cossack forces) against the Ottomans. The war really kicked off with the Ottomans’ 1683 attempt to besiege Vienna, and when that siege failed the Ottomans spent most of the rest of the war losing territory to the various European powers. Ultimately the war would end with the 1699 Treaty of Karlowitz, which was really the first time the Ottomans were forced to conclude a peace treaty entirely on European terms and which thus marks a real turning point in the Ottoman-European rivalry. It also set up the Habsburgs and an emerging Russia as the two rising powers in Eastern Europe. Mohács was primarily fought between the Habsburgs (with a substantial number of allied Bavarian troops) and the Ottomans, with the Habsburgs led by Duke Charles V of Lorraine (Habsburg Emperor Leopold I’s brother in law) and the Ottomans by their Grand Vizier, Sarı Süleyman Paşa. Both armies are thought to have numbered around 60,000 men. The Europeans were on the offensive, trying to follow up the 1683 victory at Vienna, and despite Ottoman interference they were able to cross the Drava River in eastern Croatia in late July, at which point they began moving north toward the town of Siklós (also in southern Hungary). The Ottomans decided to strike while the Habsburgs were on the move, which allowed them to concentrate their numbers and take advantage of a localized numerical advantage by overwhelming Charles’s left wing. Ottoman artillery began shelling the Habsburg forces, but after an initial Ottoman cavalry charge failed, Sarı Süleyman Paşa ordered the Ottomans into their familiar tactic of setting up fortifications and playing defense. This gave the Habsburg right wing time to get on the field, at which point Charles ordered a counter-attack. Sarı Süleyman Paşa then countermanded his earlier order and prepared to attack again, which basically left the Ottoman army in a state of confusion. The Habsburgs again held off the Ottoman advance and then attacked themselves, and because Sarı Süleyman Paşa hadn’t been able to make up his mind earlier in the battle, the Ottoman defenses were only half-finished. The Habsburgs were able to rout the Ottoman infantry, and the terrain prevented a last-ditch Ottoman cavalry counter-attack. In all, the Habsburg/Bavarian army lost about 600 men to the Ottomans’ roughly 10,000. Now, the Ottoman Janissaries weren’t the friendliest bunch in the best of circumstances, but after a costly and humiliating defeat like this they were pissed, and they knew exactly who to blame: Sarı Süleyman Paşa. The Grand Vizier had to run away from his own army, but he made the mistake of running home, to Istanbul. The army naturally followed him back there, and then decided to throw itself a good old fashioned mutiny. The Sultan at the time, Mehmed IV (d. 1693), had ruled for almost 40 years, since 1648, and he had made the conscious decision to farm out the real responsibility for running the empire to his Grand Viziers. This was not a bad idea, so long as the Grand Vizier knew what he was doing, but it was an exceptionally bad idea when the Grand Vizier was an idiot. Now Mehmed paid the price for his dereliction of duty. The soldiers demanded the execution of Sarı Süleyman Paşa, which they got on September 18, but then they decided that they’d also had enough of Mehmed, who was deposed on November 8 in favor of his younger brother, Süleyman II (d. 1691). 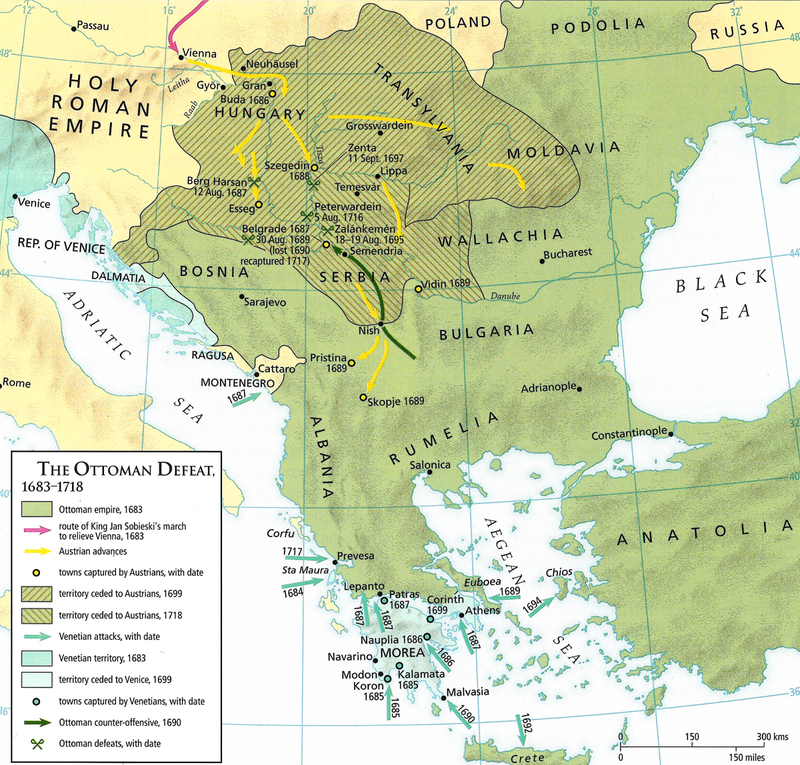 The victory at Mohács and the subsequent chaos in the Ottoman ranks allowed the Habsburg army to conquer a large chunk of Eastern Europe, including parts of modern Croatia (the region of Slavonia in the east), Serbia, Slovakia, Hungary, and Romania (Transylvania, to be precise). The recovery of Hungary, which had been mostly conquered by the Ottomans in a different Battle of Mohács (the juxtaposition makes for one of history’s best pairs of bookends, in my opinion) in 1526, was to be of lasting importance (it’s not for nothing that the Habsburg Empire later became the Austro-Hungarian Empire, you know).